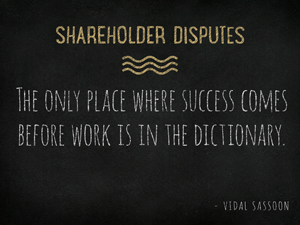 Shareholder disputes can be massive a roadblock to the success of any business, as they can interfere the regular business operations of an Illinois Corporation and cause great personal strife to those affected. Many business start-ups will grow from shareholders who are tied together by past friendship or family relations, so it is quite common for shareholders to have both a close business and personal relationship. While the close connections between shareholders can be a great advantage for business success at time, this fact usually hinders business success in the event of internal conflict or a shareholder dispute. Our Chicago corporate attorneys understand the urgency for resolving shareholder disputes so we help our clients explore the array of resolution options available for each conflict. Have you suffered a major financial loss because of negligence, fraud, or breach of fiduciary duty committed by those entrusted with your money? If so, you are not alone. In fact, these issues are often central in shareholder disputes as majority shareholders, minority shareholders and other investors are often at the greatest risk of being affected by ones of these misdeeds. Hundreds have been victims of fraud, negligence, breach of contract and other corporate breaches. Other cases of shareholder disputes may simply arise from disagreements with the terms and interpretation of a contract or a debate over the future course of a business, but the effects of this disputes can be as vicious and as taxing as a case from any other cause. Our Chicago business litigation attorneys work to provide clients with the counsel and representation they deserve in order to protect their legal rights and seek compensation, when necessary. In the event of any shareholder dispute or conflict, it is crucial to contact legal counsel in a timely manner so that the disagreement can be resolved calmly and efficiently. Please contact on our Chicago commercial litigation attorneys directly at 312-789-5676 or send us an email at contact@framewills.com.